NEOLITH sintered compact surfaces will be expanding their colour range with 4 new, exciting designs. Iron Frost (satin finish), Pietra di Piombo (silk finish), Pietra di Luna (silk finish), Strata (riverwash finish) have been added to the NEOLITH product offering in response to the market favouring neutral hues and natural motifs when it comes to interior design. Each new colour exhibits organic movement and patterning that is ideal for bringing texture to any interior or exterior design scheme. 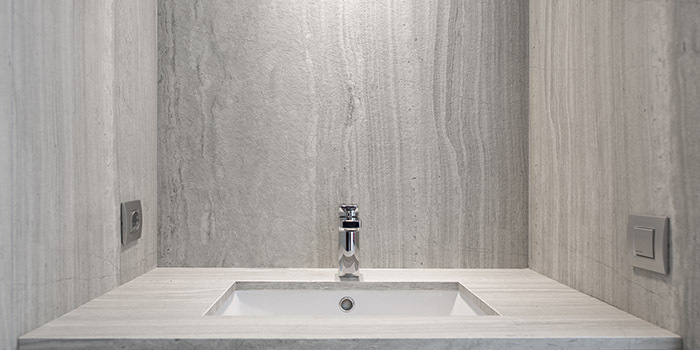 While Strata’s stone-coloured, linear patterns are reminiscent of timber-like striations often seen in natural marble, Iron Frost has an almost ethereal look in its white-spectrum patterning. Pietra di Luna and Pietra di Piombo offer gentle, but moody motifs in a light and medium grey with Pietra di Piombo sporting dark chocolate lowlights across each slab. Strata is the first NEOLITH surface to offer a riverwash finish – an extremely rough texture to the touch, whilst retaining an avant-garde aesthetic. Experience the new NEOLITH colours at Decorex Cape Town (29 April – 2 May 2016).